A workshop is the perfect escape from the demands of everyday life. Whether you use your workshop for carpentry, metalwork or automotive, the layout of your workshop is of the utmost importance. But let’s face it – most of us aren’t blessed with an abundance of space. It’s not easy to up and build your giant dream workshop. Most of us are often looking for ways to maximize the space we already have while wishing, hoping and dreaming for a BIGGER workshop. The good news is there is plenty of inspiration available to make the most of our space. Let’s take a look at some different workshop and shed layouts that utilize space in an efficient and beneficial manner. Are you working with bare bones when it comes to your workshop space? If you are really tight on space, it’s essential that you utilize every square inch of space you have. The owner of the tiny workshop above does an excellent job of just that. As you can see, even the door has been taken advantage of for storage space. And remember, when you’re short on space shelving will be your new best friend. Always look up for more space! Gardening enthusiasts, take note! 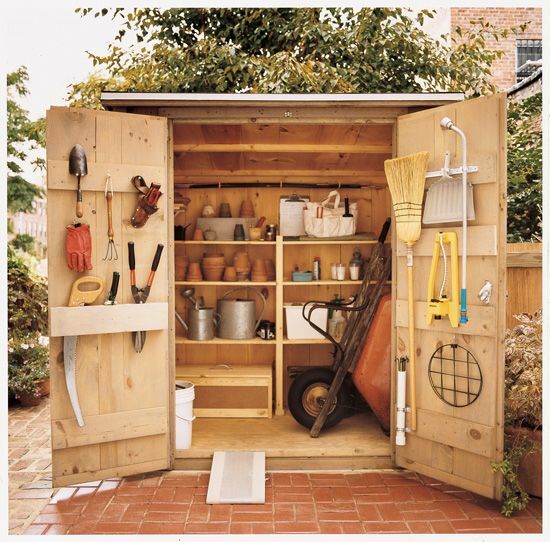 This gorgeous yet small shed workspace is optimized for tackling garden projects all season long. The owner was able to create a workspace for potting plants and also utilize the space underneath the potting station for storage. Don’t forget to also take advantage of wall space to hang tools and materials! This workshop has quite low ceilings. But as you can see, that didn’t stop the owner from utilizing the space and maximizing the work he can do here. Similar to the other layouts we’ve looked at, he has used wall space to hang tools and also utilized the space under the large saw table for storage as well. Storage containers also go a long way in both organization and space optimization. Perhaps you’re working with really limited space. This doesn’t mean you can’t have a fully functioning and awesome workshop. 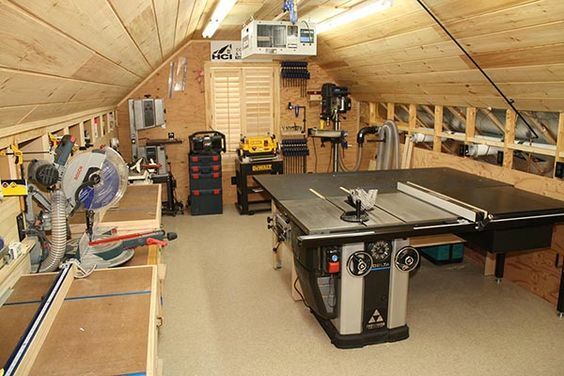 Take a look at this one-wall workshop. The owner truly utilizes the space they have. And a big part of their space saving solution is organization and drawers. 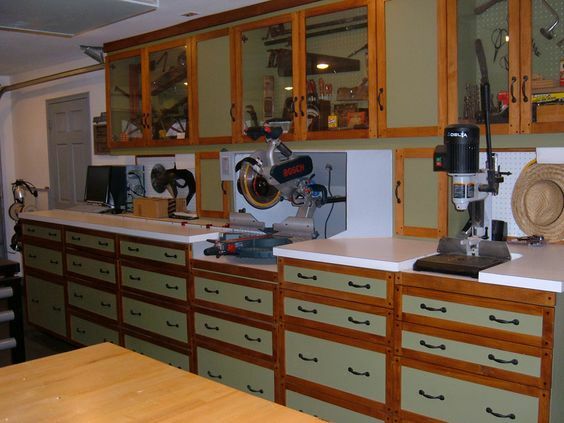 The owner is able to store both his large woodworking equipment and smaller tools and materials all on one wall. Pretty amazing stuff! 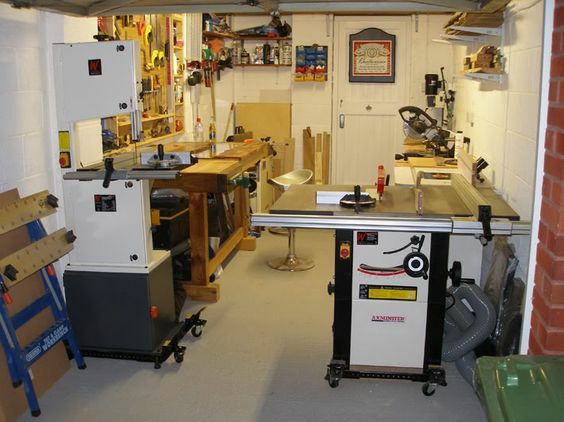 This is how one homeowner maximized his garage to create a fully functioning workshop. Shelves all the way up to the ceiling are a big space saver and this layout utilizes the technique well. Additionally, we see the owner using wall space to organize and store small tools and the space under his workstation and large equipment for even more storage. We hope you’re beginning to see that it isn’t always about HOW much space you have but how you use the space to maximize your workshop. Whether you are a carpenter, gardener or have some other awesome hobby, a workshop is a wonderful spot to spend time and use your creativity. Don’t let lack of space keep you from pursuing your craft. 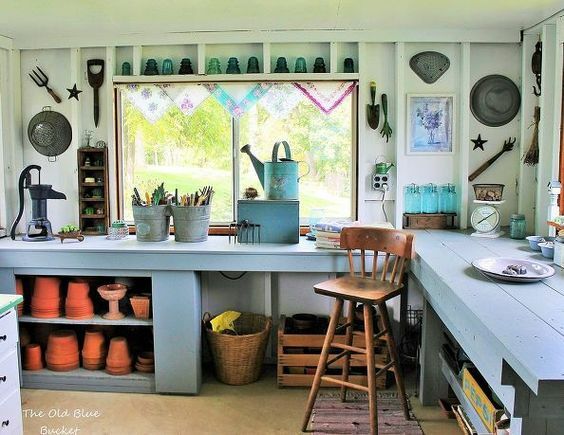 A little creativity and organizational skill can go a long way in transforming your workshop from tiny to totally spacious! And if you’re considering a workshop layout but haven’t started building yet, there’s two pieces of advice for you. First is that it’s a good idea to map out your workshop first before you build. It can save you some headaches further down the line. The second is to build larger. You will always fill it full of something. Bio: Hi, I’m Zac Spade.